Over the last week, we superkaramba developers have been working on getting things ready for a release. The big thing was GHNS support for the new theme dialog. The install portion now works for the new package format, .skz. I still have to add more specific check that looks to see if a zip type package has our xml inventory file or not. What I have works for now though as many don't distribute their themes in a zip format. A. Wiedenbruch made a really cool patch that allows superkaramba themes to have a QLineEdit box embedded into them. It works pretty well by itself, but I think there may be some drawbacks to themes that want to use this in combination with something larger. Once I figure that out, it should be in SVN. Its really something that's been needed for some time now. Thank him for his work if you get a chance! 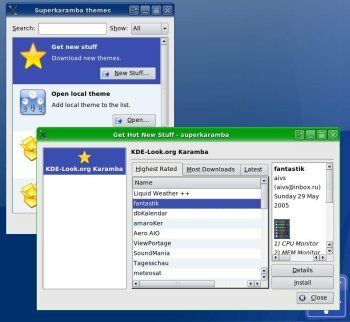 Worked a bit this weekend on getting KNewStuff into SuperKaramba. Things are moving right along. I've still got a bit of install code to work out, but here's a screenshot of it in action. 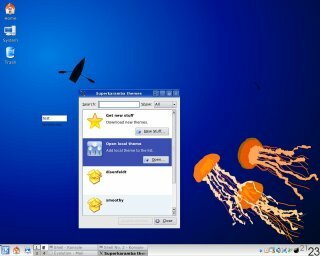 Viewing someone else's blog, I came across some really cool things you can do in KDE. The first one was using the run dialog to search google. Just press Alt+F2, enter in the dialog 'gg:something', and viola! Your search is returned in your selected default browser. The other thing I found handy is using your scroll wheel in the taskbar to make other windows active. Not nearly as cool as the google search, but definitely usable. Many people go away for the weekend of Memorial Day. I am like most people and ventured away from home with a good friend. 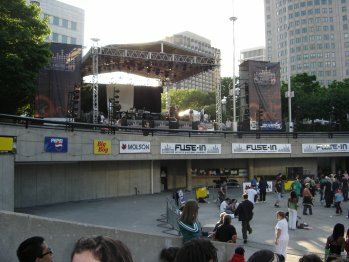 I ended up in Detroit, MI, for the Fuse-In festival. It showcases mostly electronic music. It was a lot of fun. After some quick deliberation, the name for the next transformation of the KDE desktop has been coined. Welcome Plasma! Plasma is a phase of matter distinct from solids, liquids, and normal gases. What better way is there to describe the things we'll be able to do with KDE 4.0! Some minor enhancements to the sensor displays went into SuperKaramba the last few days. Now you can display in kilobits and kilobytes should you want. I'm going to be focusing on the dreaded undeleted tooltip and the lingering clickareas shortly. New dialogs are being designed with GHNS in mind. It will eventually replace the welcome dialog and draw more of a purpose to the systray icon.